The title of this recipe is really on-the-nose. 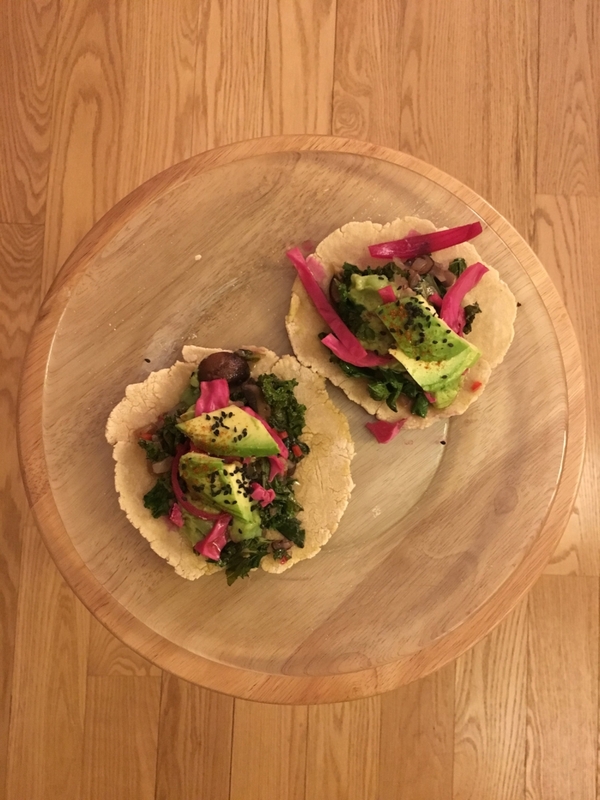 These vegan tacos were entirely made up, and honestly very good. They were very good vegan tacos. 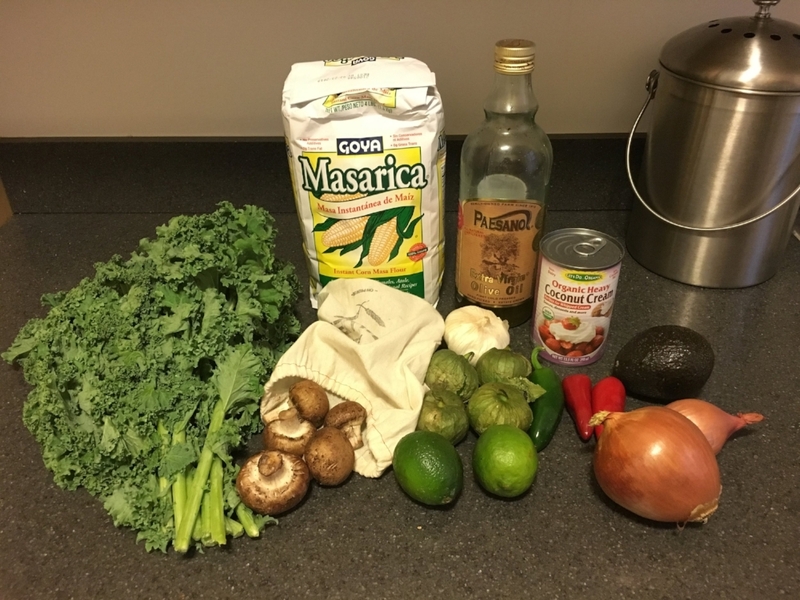 These vegan tacos started off with very good ingredients purchased almost entirely package free + in bulk, with many of the ingredients labeled as organic + fair trade. Feat. my stainless steel compost bin in the back. Hello! First mix the 2 cups Masa Harina + the pinch of salt (you can add more for preferred flavor), whisk these two ingredients together lightly. Next, slowly add lime juice and water to the dry ingredients. If you never cook, this is common. Dry ingredients first, then add the wet ingredients. slowly add the wet ingredients until the dough starts to form into a soft, sticky ball. Once the dough is compact and formed easily into a ball, cover it in your designated mixing container with a cloth, reusable wax wrap, etc. Leave for roughly an hour. We're going to move on to prepping our vegetables while the dough sits. 4 tomatillos rinsed + diced - 1 entire jalapeno pepper rinsed, seeded and diced - 2 cloves of garlic - 1/2 of an onion - juice from an entire lime - a pinch of salt. Feel free to add cilantro - I didn't for this particular recipe because I didn't have any in the house, the bunch at the store was too big for me to use up right away, and I could honestly take or leave cilantro. First, toss all your tomatillos into the food processor or blender (I used a blender and it worked just fine). Blend until they begin to liquify and then add the rest of the ingredients. Blend until completely liquified. Don't worry if it's frothy. That's normal! If it is too spicy for you, add more lime juice, if you like the spice, leave more seeds from your jalapeno. 1 avocado - roughly 1/4 of the can of coconut cream - juice from an entire lime - about 2 tablespoons of olive oil (add more if your mixture isn't blending well) - a pinch of salt. Toss everything into the blender or food processor and blend until soft and creamy. You want the consistency to be similar to sour cream, but with the fat from both the avocado and the coconut cream it could be more like pudding. That's ok! I love pudding. Set your sauces in the fridge to cool while you prep your vegetables and tortillas. Now, this is where timing is important. If you want everything to be served hot, simultaneously prep your vegetables and tortillas. This is how I made that happen. Remove the cover from your prepped tortilla dough. Take pieces off the larger ball (about the size of a golf ball, maybe a little bigger), and roll them in your hands until perfectly rounded. Then, flatten those golf-ball-sized-balls into flat tortillas. You can do this with a tortilla press, but if you don't own one, here is what I did. Get a piece of parchment paper and lightly dust with some Masa Harina, place the little ball on the parchment paper. Get a tiny rounded surface (I used the bottom of a small skillet), dust that surface with masa harina, and then press down the ball with all your might. If you want your torillas to be thinner and bigger, continue to roll them out with a dusted rolling pin. Set to the side until all your dough has been turned into tortilla shaped dough. Next, we're going to move on to prepping our vegetables. This means rinsing and dicing a head of kale, rinsing + slicing your cremini mushrooms, dicing entire shallot + 1/2 of a white onion, dicing 2 rinsed fresno chilies, and prepping however many cloves of garlic make you happy. You can dice garlic, of course, but invest in a garlic press if you cook with garlic a lot. It'll save you time and help your hands. Once your tortillas and vegetables are prepped, it's time to start cooking! Wow. Get a large skillet and set it on medium heat for your tortillas (I used a large cast iron pancake skillet for mine). Set up three medium sized skillets for your vegetables and pick your fat for cooking. I like olive oil, but vegan butter is always nice touch. If you cook with regular butter, of course that is fine too and will work perfectly well. Do remember though - different fats have different burning temperatures, so be wary of your burners and your fats. I sauteed my kale with olive oil in one pan on low heat (kale cooks really fast) and my cremini mushrooms with olive oil + a touch of vegan butter in a different pan on medium heat. My shallots + onions went into a small pan with vegan butter, and were left alone for about 10 minutes on low heat to very lightly carmelize. While you're cooking your vegetables, you can simultaneously place your tortillas onto your skillet and let them cook. You're looking for golden brown spots + for the air to rise up in the middle of the tortilla. Be sure to flip them and cook both sides. The longer you leave them on the skillet the crispier they'll be. After my shallots + onions were cooked down to release some of their sugars (I tell this by smell, but you can look for them to start to gently brown as well) I threw in the garlic and fresno chilies. Once my mushrooms were cooked down, I added the onion, garlic + chili mixture to the mushrooms, and then to the kale so everything was combined. Pay close attention to your kale so that it doesn't brown, unless you like that, which is cool too. Cool bird's eye photo that I didn't take, because my pictures are not this cool! Once your vegetables are all combined, turn off the heat and place a lid on the pan to keep them warm while you finish up your tortillas. Finally, place two tortillas (or three, or four) on a plate, add your vegetables to the center, and top off with garnishes of choice. I garnished with my avocado coconut crema, tomatillo salsa, sliced avocado, pickled vegetables (I'll post a recipe for my pickled vegetables), black sesame seeds, cayenne pepper and a pinch of both salt and pepper. I think dicing up some fresh jalapeno or serrano chilies would be delightful too, but I just used all of my peppers for the tomatillo salsa. Guess what? You're ready to serve and enjoy. Remember, if you have any questions or comments, send us a message or use our contact page on your website. Have a very good time with your very good vegan tacos!